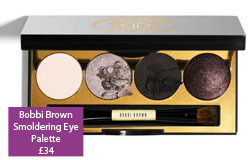 Here at beauty Resource HQ we are currently lusting after the new eye palettes from Bobbi Brown. ‘Smoldering’ (£34) is our palette of choice for the festive party season, full of versatile colours which allow you to step away from your old faithful neutral or smoky eye looks and create something a little different. The palette includes the new Bobbi Brown Long Wear Eye Paint in Port (deep plum) and eyeshadows in Ivory (creamy white, matte), Heather (pink heather, metallic) and Charcoal (dark grey, matte). Tip: To make blue/grey eyes pop try a wash of Ivory as a base colour with Heather on the lid and Port applied wet as a liner.